Video game movies have a reputation for sucking among both movie fans and video game fans. ASSASSIN'S CREED makes an effort, but ultimately fails to change that. The film is reasonably faithful to its source material, focusing on a man named Cal (Michael Fassbender) who is being used in a past life regression experiment by a secretive group of scientists and shady characters. The scientist heading up this experiment is Sofia (Marion Cotillard), and she claims her goal is to find a way to rid mankind of its violent impulses. But the person who is really running the show is Sofia's father Rikkin (Jeremy Irons), who is himself working for a secret society descended from the Knights Templar. His goal, and the group's, is to use Cal's memories to help find "The Apple of Eden" (yes, that apple), which they believe contains information that can eliminate free will in humans at a genetic level. During his regression sessions, Cal finds himself in Spain circa 1492, where he is the assassin Aguilar. He and his associates are trying to protect the son of a sultan from being captured by the Templars for use as a bargaining chip to obtain the aforementioned apple. This necessitates scenes of CGI-assisted parkour and martial arts fighting. No nearly enough to make up for the clunky and dull plot we have to endure to get to them, though. There is some half-hearted attempt to give the material some subversive subtext, quoting Hashashin founder Hasan I Sabbath's alleged last words, "nothing is true, everything is permitted" a few times without actually engaging with what that means philosophically. It bears mentioning for those who don't know the history that assassins were a specific sect of Islam, known as the Hashashin, and not nearly as simple as the hired killers the word assassin applies to in modern times. 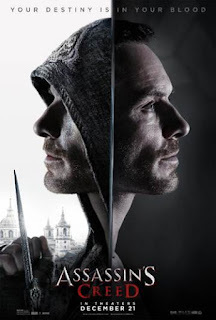 Making the assassins the good guys and the Christian secret society of Templars the bad guys is easily the edgiest thing the movie (and game it's based on) does, but it's not dealt with in any depth. And as for historical accuracy of any of this, well, let's just say you generally don't want to get your history lessons from Hollywood. The historical relationships between the two groups are considerably more complex. And then there's a certain historical figure (I won't say, but you can guess by the year the flashbacks take place in) whose involvement in this nonsense is highly dubious. None of this would matter much if the movie was as entertaining as it should be. But despite being helmed by promising indie director Justin Kurzel (THE SNOWTOWN MURDERS), not to mention the cast of distinguished performers like Fassbender, Irons, Cotilliard, and Charlotte Rampling and Michael K. Williams on hand, ASSASSIN'S CREED never really clicks. You can tell Kurzel is straining mightily to make this a serious, relevant film. But the script he's working from (credited to Michael Lesslie, Adam Cooper, and Bill Collage) isn't on that level. So the end result is a movie that feels like pretentious cinematic junkfood. The clunky editing, at least somewhat a result of the constant shifts back and forth between eras and realities, only makes it worse. Seriously, once we get the general idea that when Cal straps into his wayback machine he's in the past, do we really need to keep interrupting the action in the past to show quick cutaways of him in the present squirming around in his contraptions? No. The answer is no. Visually the film does a good job capturing the look of its source material, and if you've ever played ASSASSIN'S CREED, much of the action in the film will feel familiar, too. That may be enough to satisfy some viewers, but really, wouldn't you rather just play the game again than shell out more money to watch a subpar adaptation of it on the big screen? 2 out of 2 stars.